And so it appears we are living in a time of Monster Kelvin Waves — powerful confluences of Pacific Ocean heat running just beneath the surface — bringing with them the potential for both record global temperature spikes and strong, climate-wracking El Nino events. Last year, a powerful pulse of sub-surface heat called a Kelvin Wave rippled across the Equatorial Pacific. It shoved sub-surface temperature anomalies into an extreme range of 6 degrees Celsius above average at a depth of 90-130 meters over an equatorial zone stretching out for hundreds of miles. Overall, this heat surge pushed anomalies below the rippling waves of the vast Equatorial Pacific from New Guinea to the Central American Coastline above 1.8 degrees C hotter than average. This immense heat pulse was enough to shove the equatorial region inexorably toward El Nino status. By September, mid-ocean values were hot enough to have reached the critical threshold of 0.5 C above surface value average. Perhaps more importantly, the Winter/Spring 2014 Kelvin Wave also contributed to record positive PDO values for the Pacific by December of 2014. A surface heat departure that was unprecedented to modern climates. Block-busting ocean warmth that almost certainly spurred 2014 global atmospheric temperatures to new all-time record highs in the current age of human warming. Now, a second, and equally strong monster Kelvin Wave is again rippling across the Pacific Ocean subsurface zone. A powerful pulse of heat that will reinforce the current weak, mid-ocean El Nino, lend energy to ridiculously warm Pacific Ocean sea surface states, and pave the way for a long-duration equatorial heat spike. As we can see in the NOAA CPC rendering above, the current Kelvin Wave is a massive and extraordinarily warm beast of a thing. It encompasses most of the thousands-miles broad Equatorial Pacific with its hottest zone peaking at 5-6 degrees Celsius above average temperatures — a region that stretches from near the Date Line all the way to just west of Central America. At +1.75 C for the entire below-surface equatorial region, the current Kelvin Wave is already approaching last year’s peak values. Values it may well exceed in the coming days. Overall, the current Kelvin Wave seems to have more connection to the surface environment than last year’s powerful surge. A massive plug of Pacific Ocean heat readying to belch back into the atmosphere. Already, NOAA is upping its forecast chances for El Nino to continue through summer to 70 percent and is placing a greater than 60 percent chance that El Nino will stretch on through late autumn. An upshot from earlier predictions made just a little more than a month ago that El Nino formation for 2015 remained uncertain. Now, we have a rather high certainty that El Nino will continue throughout at least the next 4-6 months. The departures we see in this long range forecast are extraordinary — rivaling or possibly exceeding the intensity of the 1998 Super El Nino. An event of this kind would result in powerful ocean and atmospheric surface temperature spikes, catapulting us well beyond the climate range previously established by the 1998 event. Globally, we would be entering new, record hot territory, possibly approaching 1 C above 1880s values for the 2015-2016 period. As such, we should consider this to be a troubling situation, in need of close, continued monitoring. To this point, it is worth noting that El Nino prediction during Spring is highly uncertain. Last year’s very strong Kelvin Wave also set off predictions for a moderate-to-strong El Nino event by summer-through-fall. 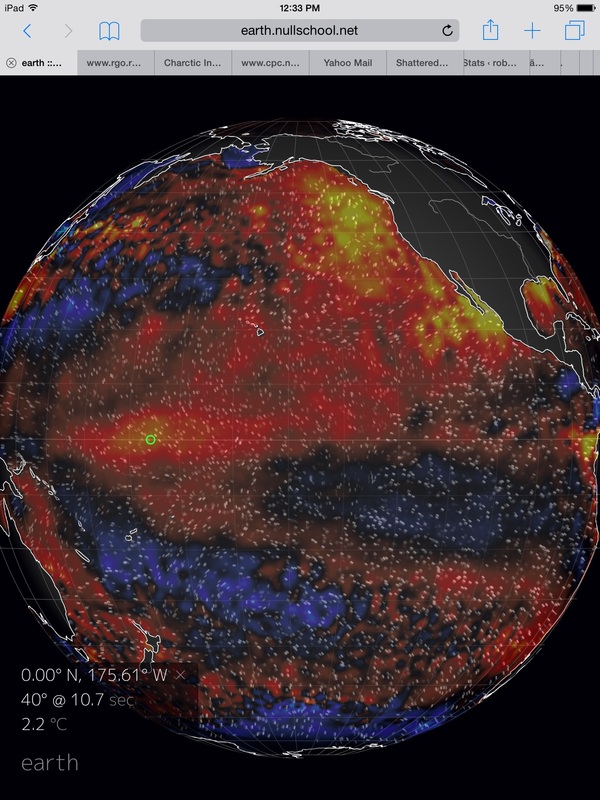 Though El Nino did eventually emerge, it was weaker and later in coming than expected. Now, a new set of conditions is setting up similar, and perhaps, even more intense ocean and atmosphere heat potentials. Though still uncertain, what we observe now are ocean conditions that raise potentials for both extreme El Nino and human-warming related weather. Powerful ocean heat pulses of the kind we observe now, when combined with an extraordinary human greenhouse gas heat forcing, also increases the likelihood of another record warm year. El Nino associated droughts and heatwaves — particularly for South America, India, Australia and Europe through Central Asia are at rising risk. In the event of mid-ocean El Nino, the risk increases that the 1200 year California drought will continue or even intensify. If the heat pulse shifts eastward, a switch to much heavier rainfall (potentially terribly heavy) could coincide with a breaking of the Ridiculously Resilient Ridge pattern that has warded moisture away from the US West Coast for nearly three years. Extra heat of this kind would also tend to enhance precipitation extremes — more rain when it does rain and far more intense drought in areas affected by heat and atmospheric ridging. Given the patterns we have observed over the last year, we could expect worsening conditions for some regions (India, Australia, some sections of South America, Eastern Europe) and the potential for a shift from one extreme to the next for other regions (US West Coast). These potentials depend on the disposition and intensity of surface heat in the Pacific, which bears an even closer watch going forward. Atmospheric Warming to Ramp up as PDO Swings Positive? Another hottest month on record for the global climate. And this one is a bit of a doozey. According to NASA GISS, September of 2014 saw global surface temperatures that were 0.77 C hotter than the 20th Century average. This record beats out 2005 by a rather strong 0.04 C margin and represents the 3rd month in the GISS record for 2014 that was either the hottest or tied for the hottest (May, August and September). Ocean surface heat and anomalous warmth at the poles were deciding factors for the new September record with very few regions of the global ocean surface showing cooler than average temps and with extraordinary heat at the poles, especially in Antarctica. This southern polar zone experienced average monthly temperatures as much as 8.7 above the global average across a relatively broad zone. Both East and West Antarctica observed this very strong polar amplification with East Antarctica experiencing the peak anomalies. The zonal anomalies map for September of 2014 showed no latitudinal zone experiencing cooler than 20th Century average conditions. A rather extraordinary feature considering most months show cooler than 20th Century average conditions along at least some latitudes. Most extreme heating occurred at or near the poles with the 75-80 degree South Latitude zone showing an extraordinary +3.4 C departure from the global norm and the 80-90 degree North Latitude zone showing a strong +1.75 degree positive anomaly. The only zone showing near 20th Century average temperatures was the heat sink region of 55 to 60 degrees South Latitude in the Southern Ocean. In this climate region a strong storm track combines with an expanding fresh water wedge issuing from melting Antarctic glaciers to force down-welling and atmosphere to ocean heat capture. A heat capture that was alluded to in a recent scientific paper which found the upper Southern Ocean contained between 24 and 55 percent more heat than expected. This heat sink region, featuring an expanding fresh water wedge has been instrumental in somewhat higher than normal Antarctic sea ice totals. An impact that is, ironically, driven both by Antarctic continental ice melt together with an increasing storminess in the Southern Ocean and waters more heavily laden with salt issuing from the equatorial zone. A highly unstable confluence that results in local surface cooling as the ocean takes a heavy dose from the human riled heat engine. No El Nino yet, despite two warm Kelvin waves and somewhat favorable atmospheric conditions throughout the months of August and September. But sea surface temperature in the Equatorial Pacific region remain somewhat hotter than normal — bending toward the warm side of ENSO neutral. Overall ocean surface warmth, however, was extraordinary throughout September, pushing well above the global average and ranging, in GFS models, from 0.7 C to 1.2 C above the already hotter than normal 1979 to 2000 average. Overall, three more record or near record hot months would put 2014 in serious contention for hottest year on record (2014 is running 0.65 C hotter than average, the global record is 0.67 C above average for 2010). A rather odd result considering we still see no El Nino and almost every recent hottest year has been spurred on by this powerful atmospheric variability driver. A record hot year in 2014 with no El Nino could well be an indication that the human forcing is beginning to over-ride natural variability and that the ENSO signal, though still very powerful, is becoming more and more muted by an increasingly substantial human heat forcing.